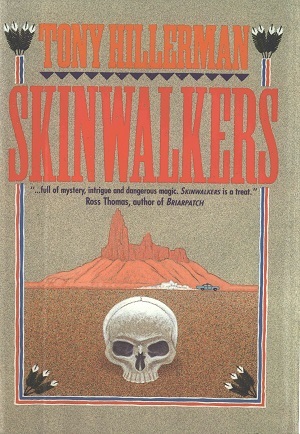 This is the first edition of Skinwalkers, which is Tony Hillerman's seventh Navajo Mystery novel. This edition was published in 1988 by Harper & Row in New York City, New York. The cover illustration is by Peter Thorpe. Thorpe began designing the covers for the Navajo Mystery novels in 1986 beginning with this edition's cover art. He is best known for incorporating both sandpainting stylized figures and elements from each novel's plot. Format: Hardback, 23.9 x 16.1cm. Binding: Cream boards with a red cloth spine and a star decorative symbol impressed on the front board. The author, title, and the publisher is printed vertically in silver on the spine.